PHILADELPHIA (AP) — Ji-Man Choi casually jogged to first. The jubilation in the Brewers' dugout indicated otherwise. "I thought it was a fly ball," Choi said through a translator. "I'm just really happy I was able to get this hit." Jake Arrieta (5-4) had a 3-2 lead in the sixth when the Brewers loaded the bases with one out on a catcher's interference call against Jorge Alfaro, a walk and a hit batter. Luis Garcia relieved and struck out Orlando Arcia. Choi fell behind 0-2, worked the count full and drove a 98.6 mph fastball to the opposite field in left..
"It was just a great at-bat," manager Craig Counsell said. "After two pitches, I think most people would say he was in a lot of trouble. He put a really good swing on a ball to a place where he has some power over there." Choi has nine career homers, including two this season. He played with the Los Angeles Angels in 2016 and briefly with the New York Yankees last season. "One of my favorite moments of the year," said Brent Suter (6-4) allowed three runs and four hits in five innings. Jesus Aguilar and Jonathan Villar also went deep. 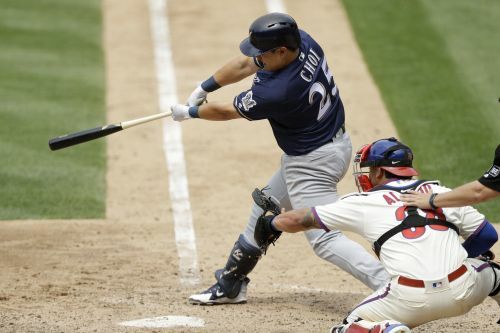 Aguilar drove in three runs and Christian Yelich had three hits for the Brewers, who have outscored Philadelphia 24-7 in a pair of wins that maintained their NL Central lead over the Chicago Cubs. Arrieta allowed five runs — four earned — four hits and two walks in his first start since making critical comments of the Phillies' defensive shifting strategy following Sunday's 6-1 loss at San Francisco. "I expect to get out of that inning unscathed and be able to maintain the lead, and I just wasn't able to do that today," Arrieta said. Milwaukee opened a 10-3 lead in the seventh against left-hander Adam Morgan when Aguilar hit an RBI double and scored on Ryan Braun's single, and Villar hit a two-run homer. Aguilar hit a two-run, opposite-field homer to right in the first, ending rrieta's home scoreless streak at 15 1/3 innings. Arrieta's home ERA spiked from 0.84 to 1.69 and he lost his first game at home in six decisions over eight starts. Hoskins, wearing a helmet with protective flaps over both cheeks, put the Phillies ahead 3-2 with a third-inning homer — his first long ball since fouling a ball off into his face on May 28 at Los Angeles. Hoskins pinch hit the following night against the Los Angeles Dodgers, then missed nine games — seven of them Phillies losses. "It was clear that his presence in the lineup was felt," manager Gabe Kapler said. Braun, who had an RBI single in the seventh and tripled in the ninth, is batting .403 with 40 RBIs in 33 games in Philadelphia. Counsell benched 3B Travis Shaw for failing to run out a ground ball to the pitcher in the seventh. Morgan's throw was high, but 1B Carlos Santana had enough time to leap, find the bag and retire Shaw. Brewers: Kratz, who was plunked in the left ribs and left upper arm, shook off getting hit both times. Phillies: OF Dylan Cozens (left quadriceps) was placed on the 10-day DL after injuring himself in the field on Friday night. Brewers RHP Brandon Woodruff (2-0, 6.05) faces Phillies RHP Zach Eflin (2-2, 3.74) in Sunday's finale of the three-game series.